Ex-world champion boxer Chris Eubank has been bailed after his arrest for an alleged breach of the peace while protesting in his truck in Whitehall. 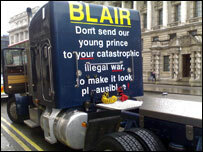 He had been driving his truck bearing a banner stating: "Blair, don't send our young prince to your catastrophic illegal war to make it look plausible." Mr Eubank, 40, of Upper Drive, Hove, East Sussex, was taken to Charing Cross Police Station for questioning. He was bailed to return to a London police station on 29 March. Mr Eubank is a familiar figure in his home town of Hove, and can often be seen driving around in a large black truck with his name emblazoned on the side. He left Charing Cross police station on Thursday night. Mr Eubank was one of the world's top boxers in the late 1980s and early 1990s, and is renowned for always being immaculately dressed.